Have you ever wondered how a guitar's pickups affect its sound? Well, everything about a pickup has some influence, but some factors are more important than others. To keep things brief, I'll focus on magnetic pickups, and not piezo bridge pickups, which are used mainly to produce a pseudo-acoustic sound. 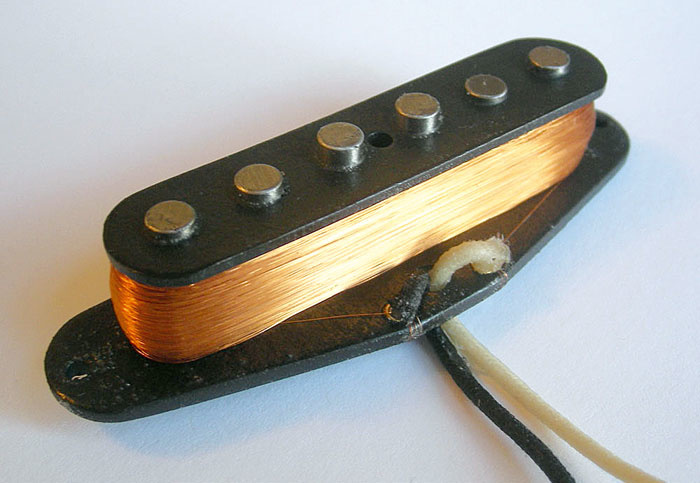 The inside of a single-coil Strat pickup, showing the rod magnets wound with insulated wire.A pickup is a type of electrical generator based on Faraday's laws, which state that a varying magnetic field will induce an electrical current into a conductor passing through that field. Magnetic pickups can only work with guitar strings made from a ferro-magnetic metal (iron, steel cobalt or nickel) because the strings must be able to disturb the magnetic field generated by the permanent magnet in the pickup, to induce a current in the coil that surrounds it. Single-coil pickups are the simplest, and comprise either a single central magnet or separate magnets beneath each string. The magnet may be made of magnetised steel or a magnetic alloy, such as Alnico (Aluminium, Nickel and Cobalt), Samarium Cobalt or Neodymium, although in some designs a ceramic magnet is used to energise soft iron pole-pieces that are placed in contact with it. The Fender Strat pickup is a typical single-coil design, with six magnetised pole-pieces (each one a short bar magnet) wrapped with a large number of turns of fine, insulated copper wire (although some budget imported Strats have a ceramic magnet stuck to their base and the pole-pieces are simply soft iron). Different magnet types produce a different shape of magnetic field, which will affect the sound of the pickup. Although single-coil pickups can sound excellent, they tend to pick up electromagnetic interference from sources such as power transformers and lighting dimmers. Careful screening can improve the situation, but is rarely entirely successful in today's stage environments, festooned, as they are, with computer-controlled lighting (even a local pub's light dimmer can cause problems). The humbucking pickup, devised by Gibson engineer Seth Lover in the '50s, counters this problem. A humbucker comprises a pair of single-coil pickups mounted side-by-side, with the magnetic polarity inverted in one, and the coils connected in series. The signal picked up from the strings combines in a positive way, but any induced hum tends to cancel, much like a balanced microphone connection. The two coils are connected out-of-phase, but inverting the magnets in one puts the signal from the vibrating strings back in phase and cancels out induced noise. Modern Strat designs have a reverse-wound, reverse-magnet middle pickup, so that you can get a humbucking effect when the middle pickup is selected at the same time as the neck or bridge pickup (positions two and four). Some pickups have a metal cover to protect the delicate coils and to provide a measure of shielding, and these colour the sound as they interact with the magnetic field of the pickup. Other pickups may use a plastic or non-ferrous metal cover, while others simply have adhesive fabric tape wound around the coils. So that's the physics, but what gives a pickup its own sound? The positioning of the pickup is vitally important: different emphasis will be given to different harmonics depending on how far away the pickup is from the end of the string (the bridge). The nearer to the bridge the pickup is mounted, the more the high-order harmonics are stressed. Another important factor is the so-called 'magnetic aperture' of the pickup: how much of the string's length interacts with the pickup's magnetic field. A physically narrow pickup with a well-focused magnetic field (as used in Strats) picks up energy from a relatively short section of the string, giving a more extended high-frequency response than you'd get from a broader pickup. This is because the relative phase of the string's harmonics varies with position, and if you pick up sound from two or more places along the string's length, the higher harmonics will cancel out to some extent. So by combining pickups you can achieve different tonal characteristics, but when the two pickups are very close together (as with a standard side-by-side humbucker) the tonal character exhibits significant cancellation of the higher harmonics. Single-coil pickups with wide coils also have a wider magnetic aperture than narrower pickups, which is why replacing a Strat pickup with a P90 produces a warmer sound. Other factors, such as the type of magnetic material used and the shape of the magnet, also affect the magnetic aperture. With side-by-side humbuckers, the combined shape of the magnetic field is also quite different from that of a single magnet, as the lines of force pass from the north pole of one magnet to the south pole of the other, rather than wrapping around to their own south pole as with a single-coil design. Basically, the wider the magnetic field surrounding the string, the more high-frequency cancellation takes place. The magnet in a pickup can also affect the way a string vibrates (especially if the pickup is set close to the string), and it's an effect many Strat players have witnessed, especially on the higher frets of the low E-string. So pickup designers can get a high output with fewer coil turns (to reduce inductance) by using a stronger magnet, but at the risk of affecting the way the string vibrates. Significant tonal changes are brought about by the inductance of the pickup coil and the capacitance between the windings. Inductance is related to the number of turns of wire and the magnetic properties of the pole-piece, and capacitance is affected by the number of turns and the thickness of the insulation on the wire. Indeed, inductors and capacitors are the basic building blocks of tone controls and filters — so a pickup's coil acts as a tone circuit, in combination with the resistance of the guitar's volume control, the capacitance of the guitar cable, and the input impedance of the amp. Most pickups have a noticeable resonant peak, where the capacitance and inductance combine to form a low-Q resonant circuit: this is what gives a pickup its 'bite'. Even changing your cable can alter the frequency of the resonant peak, but low-capacitance cables don't necessarily produce the best subjective sound. While most modern pickups are very neatly wound by automated machines, lower capacitance can be achieved by winding the wire more randomly (referred to as 'scatterwinding'), which can produce a slightly higher-frequency resonant peak. Alternatively, more turns of wire can give a 'hotter' output, without changing the resonant peak. The resonant frequency of a typical pickup lies in the 2.5 to 4.5 kHz region — and the higher the Q, the more noticeable the coloration. In most cases the peak is only a couple of decibels, but in combination with the natural high-cut filtering of the coil and the magnetic aperture effect, it's enough to give the pickup a distinct tonal character. Because humbuckers have two coils wired in series they tend to have more overall inductance, which makes them produce a warmer, less treble-heavy sound than single-coils. The signals generated by the two coils are summed, so humbuckers also generally produce a higher output level, although the physical spacing of the two coils will accentuate some harmonics and attenuate others (the magnetic aperture effect again), in much the same way as when you use two mics at slightly different distances on the same sound source. 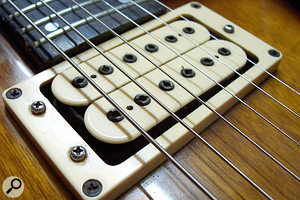 The output from any magnetic pickup relates to its distance from the string, so the pickup's height-adjustment screws can be used to balance its output with that of other pickups. In most cases it's possible to tilt the pickup so that the treble side is closer to or further from the strings, enabling the balance between low and high strings to be adjusted (some pickups have adjustable screw pole-pieces to enable individual string levels to be balanced). Changing the pickup distance from the strings also changes the effective magnetic aperture, so some tonal change may also be heard, but this isn't usually serious unless you get the pickup too close to the string, in which case the signal becomes non-linear (distorted) due to the string being in a stronger magnetic field when vibrations carry it closer to the pickup than when it is vibrating away from it. Sometimes this sounds good, sometimes it doesn't! Some Strat players like to have one or more humbuckers on their guitars, with one the same size as the original single-coil pickups, and there are several ways to achieve this. The first, and most obvious, is to build a conventional humbucker with two very slim coils, sometimes arranged around a narrow 'blade' style pole-piece rather than separate bar magnets. DiMarzio and Seymour Duncan, amongst others, make pickups this way, and the sound comes very close to what you'd expect from a full-sized humbucker, despite the fact that such pickups have a smaller magnetic aperture than a full-size side-by-side design. The coil inductance can be tuned to produce a range of resonant peak characteristics, but the sound is essentially what you'd expect from a humbucker, with a fat mid-range and a smoother top end than you'd get from a narrow single-coil pickup. By grounding the wire that joins the two coils, a humbucker can be 'coil-tapped' to produce something much closer to a traditional single-coil sound... but this means no hum-cancellation. The humbucking pickup has two single-coil pickups out of phase, but with the magnets reversed in one, so that it cancels induced noise while keeping most of the wanted tone from the strings. This principle lies at the heart of most modern pickup designs.So how do you capture the single-coil sound and keep the hum-cancellation? The simplest way is to build two pickups with the coils and magnets arranged as in a traditional humbucker, but to make the coils smaller, with one sitting beneath the three high strings and one beneath the three lower strings. Providing the combined inductance of the two coils is not higher than for a single-coil pickup, you'll retain the single-coil 'twang'. The first time this idea was implemented was, I believe, on the Fender Precision bass, but it's now used on some six-string instruments, including G&L's ASAT Z3. An adaptation of this idea, used in some rail-style humbuckers, uses a standard mini-humbucker with two full-width, side-by-side coils, but one coil is fitted with a magnetic pole-piece that covers only the top three strings, and the other with a pole-piece covering only the lower three strings. This system is used in, for example, Seymour Duncan's Vintage Rails pickup. I've also tried some budget versions that are rather like a slightly fatter sounding single-coil. Again, the tone depends on the inductance of the coils, with fewer turns giving a higher resonant peak but a lower output voltage. Finally, there's the stacked humbucker, which looks much like a conventional single-coil design. The two coils are placed one above the other, again wired out of phase for hum-cancellation. If that's all there was to it, the wanted signal would cancel out too, as both coils sit on the same set of magnetic pole-pieces, but clever design tricks overcome this: placing the lower coil in a weaker magnetic field, for example, so that it makes less contribution to the output but still cancels the hum; or making the lower coil smaller than the main one, but screening the main coil such that the amount of hum picked up by both remains the same, so that cancellation still occurs. There's a lot of secrecy in the stacked-humbucker world, but companies such as DiMarzio and Kinman make such pickups that get very close to the sound of the equivalent single-coil version, and even Fender have developed a 'noiseless' stacked humbucker.